Don’t miss out. Register Now. It’s almost full! 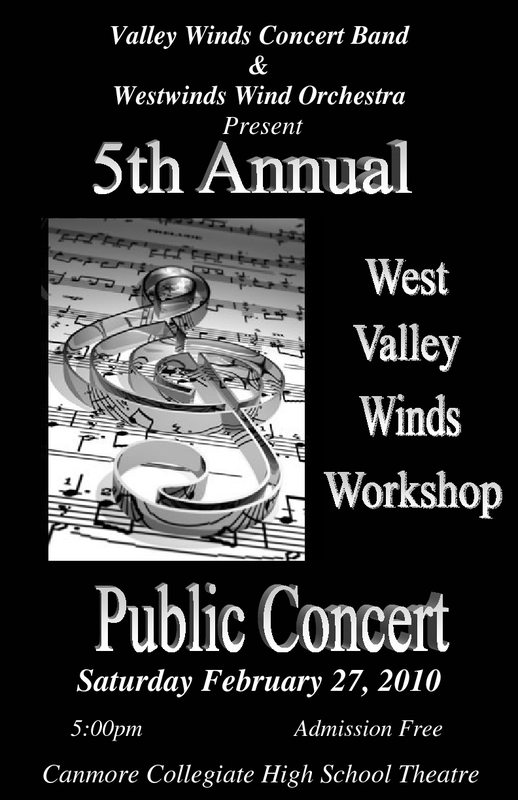 This is the fifth annual West Valley Winds Workshop, hosted by the Valley Winds Music Association (Canmore) and Westwinds Music Society (Calgary). Geared to Grade 3.5-4.5 players, the entire workshop (Friday evening and all day Saturday) will be held in full ensemble under the direction of our guest conductor, Clinton Marshall. Previous guest conductors for the workshop have been Dr. Mark Hopkins (University of Calgary), Dr. Dale J. Lonis (Winnipeg Symphony Orchestra), Dr. Gillian Mackay (University of Toronto) and Mr. Patrick Winters (Eastern Washington University). After the Friday evening sight reading session, everyone is invited to the Communitea Café for a closed party featuring our own jazz jam. Our rhythm section will lay down the beat and all are welcome to join in or simply listen and socialize with friends. Hotel accommodations are available at a special rate for the workshop. Simply indicate on the registration form that hotel accommodations are needed and you will be emailed the phone number and reservation code. 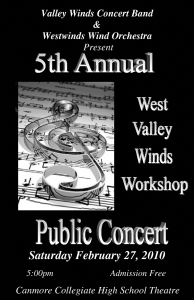 On Saturday at 5pm, the workshop will close with an informal concert offered to the community. If you can’t attend the full workshop, drop in to the free concert to join in the fun and hear some great music!